Created With: HTML, CSS, and PHP. 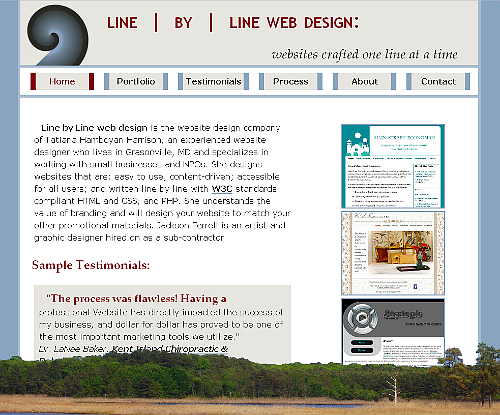 This was my first serious attempt at re-branding my website company from funnel's Web Design to Line by Line web design. This design was meant as a transition design between the two names. To ease the transition, I kept the shell logo, though it had nothing to do with the new company name. After a year of using this design, during which time I had the fortune to create websites for some very creatively-inspiring people, I was ready to come up with something new. Other design updates included: the removal of the right and left floating boxes for most pages, the deletion of the right "Websites / Designs" box on the Portfolio page, and other minor style changes.